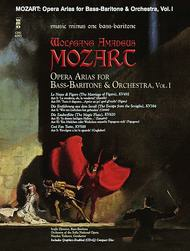 MOZART: Opera Arias for Bass-Baritone with Orchestra, Vol. I composed by Wolfgang Amadeus Mozart (1756-1791). For bass/baritone voice. Vocal Score and CD+G. Published by Music Minus One (MO.MMOCDG4093).ISBN 1596155728.This collection of Bass-Baritone arias presents a wide variety from Mozart's greatest operas. Listen to master bass-baritone Ivajlo Djourov work his magic, then he stands aside so you can stand center stage with the world-famous Sofia Opera Orchestra!Includes an expansive, newly engraved vocal score, printed on high-quality ivory paper; and a CD+G graphics-enabled compact disc with complete versions (with soloist) in digital stereo, followed by digital stereo orchestral accompaniments to each piece, minus the soloist. About CD+GCD+G (CD+Graphics) is a special disc format in which simple graphics and text are stored in the sub channels of an audio disc. When you play a CD+G disc in a CD+G compatible player (like a karaoke machine), lyrics and images appear on the monitor or TV screen in time to the music. If you play a CD+G disc in a regular CD player, you'll still be able to hear the music and sing along to your favorite tracks, but the graphics features won't function. The CD+G format is a fun and useful learning tool!